A wetter than average end to the year has helped boost Yorkshire Water’s reservoir levels, which had been impacted by one of the driest summers on record in 2018. The Environment Agency recently approved the water company’s application for a drought permit to increase the annual abstraction limit for the River Wharfe. Meanwhile an application for a drought permit for changes to the abstraction licences for the River Derwent is currently being considered. The weather has been wetter since the end of November, with December seeing 135 per cent of the long-term average rainfall. This wet weather, combined with the use of Yorkshire’s “unique grid system” to maximise river and groundwater sources has led to significantly increased reservoir stocks in the region. During the last week of November and first two weeks of December 2018 reservoir stocks increased by 26 per cent – the largest ever improvement in reservoir stocks over a three-week period in Yorkshire. Reservoir levels are now closer to normal levels and at the start of January 2019 were at around 84 per cent. The latest figures have been published as part of Yorkshire Water’s commitment to publishing water resources data through its open data programme, which was announced last month. 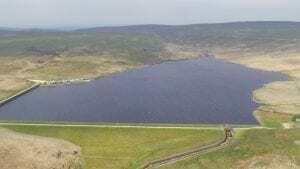 Yorkshire Water said the improved situation means the company no longer needs to pursue drought permits to reduce compensation flows from the region’s reservoirs. However, it is continuing with drought permits for two rivers, the Wharfe and the Derwent. Richard Flint, chief executive of Yorkshire Water, said: “Overall the position has improved significantly in recent weeks, but we are not complacent and will continue to carefully manage the situation throughout the winter to ensure we are in the best possible position going into next spring and summer. The summer’s dry weather has also prompted Yorkshire Water to look at new options for managing demand in dry weather for the future. Flint added: “Traditionally the response to drought conditions has been to consider restrictions on customers’ water use, such as hosepipe bans. But a lot has changed since the idea of hosepipe bans was developed, both in terms of technology and people’s attitudes.